Walking down the Maltese memory lane + GIVEAWAY! That feeling is what Te fit-Tazza is presenting with its beautifully minimal depictions of Malta. Founded only last year by Andrew and Craig, Te fit-Tazza (the name itself is evocative of the only way you should drink tea - from a glass accompanied with half a dozen pastizzi) has so far produced its first series of this sort, together with a set of "elements" - the little things that instantly take you back to simpler times, and represent Maltese identity like nothing else. As everyone knows, our islands are plentiful in identity and culture, and over the years we've amassed a number of things that scream Malta. It was relatively easy, therefore, for the guys at Te fit-Tazza to get inspired by their surroundings and produce a unique product that is instantly iconic and inherently Maltese. So far, Te fit-Tazza has blessed us with the most modern and minimal depictions of Malta I've ever seen - their Series 1. From Filfla to the Valletta bastions, the portraits are all exquisite depictions of Maltese landscapes, and would blend in perfectly in the most stylish of homes. Priced at 60 Euro per piece, they're surprisingly affordable too. My favourites though have to be their Elements of Malta. Smaller (and cheaper!) portraits of the little things that make our nostalgic hearts burst, they're equally minimal and beautiful, with an added touch of fun. They represent the small things that sometimes go unnoticed, but are little gems of pure Maltese nostalgia. I can already picture them dotted around my house! You can tell that both elements and series are a labour of love - the prints are printed with the highest quality standards, yet both Andrew and Craig decided to keep their prices down to give everyone the chance to purchase them. Customer service is also quick and efficient, and they ship worldwide! Christmas presents for my uncles in Australia = sorted. All this is why I'm so happy to announce that I've been working with Te fit-Tazza to give you guys the chance of owning a complete set of elements for yourself - the Tal-Linja set! Winners will be getting three elements, unframed, depicting the different buses Malta has had over the years, making a perfect set to own and cherish. 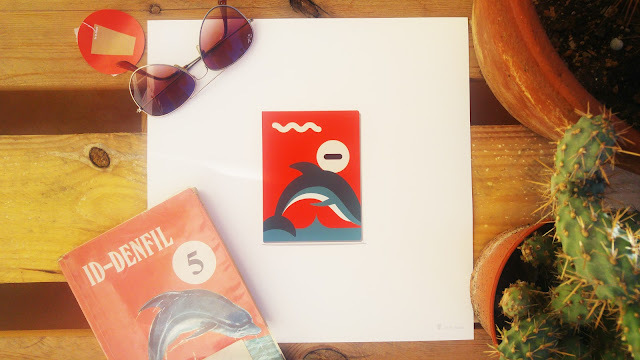 The prints are all 30cm by 30cm, printed on Decor Smooth Art 210gsm paper, and together are worth 90 Euro. Find the blue, green and yellow tal-linja on their shop here. This is your chance of owning a slice of Maltese nostalgia forever - what are you waiting for? The Anti-Tourist would like to thank Te fit-Tazza for sponsoring this awesome giveaway!